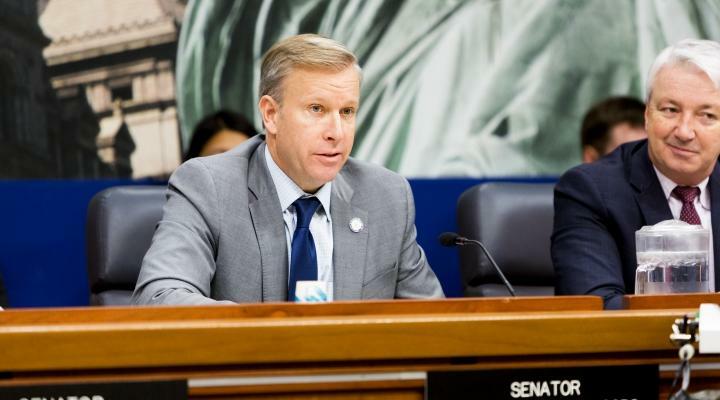 A local member of the state delegation is calling on New York's Department of Labor to abandon a proposed Employee Scheduling rule. Opponents of the rule say it could do more harm than good. Sen. Jacobs in Albany during a recent hearing on proposed Employee Scheduling rule. Senator Chris Jacobs says the proposed regulation would be the most restrictive scheduling regulation in the nation if it becomes law. Companies, like landscapers, that are weather dependent would be forced to pay employees four hours of wages even if they get rained-out and don't do any work. Jacobs says the closest state doing anything similar is Oregon. But it exempted businesses with less than five hundred employees. "This proposal is for a business whether it has fifty people, five hundred people, or two people," Jacobs said. During a recent hearing in Albany, he says, companies, social service organizations and others testified the rule would be devastating to their business. "We had Delta Sonic there who said this could force them to dramatically change the way they do business and shed over a thousand employees. To get out of the business of the hand-dried car washes. A lot of young people would lose jobs," Jacobs said. The Buffalo Republican says, it seems like the proposal was not thought through and it could have a lot of unintended consequences. "And keep this in mind - this is on top of just passing significant increases in minimum wage. Paid Family Leave. So, I think, there was a sense from businesses, that boy, there really is a pile on, on small businesses, in New York state. And, I think, there was a real level of 'this may be the last straw' with some of them," Jacobs said. After the hearing, he says, the Labor Department agreed to delay imposition of the Employee Scheduling regulation to allow more public comment. But, Jacobs says, his "great hope" is that they'll go back to the drawing board.